ULTRA HYDRASOURCE Conditioner is rated 2.1 out of 5 by 100. 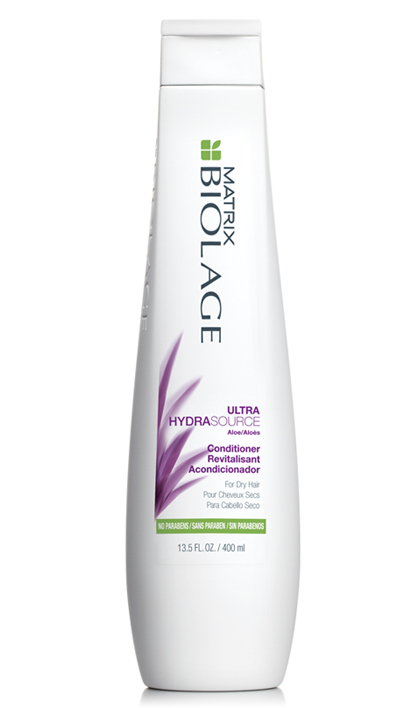 Share https://www.matrix.com/biolage/core/ultra-hydrasource/ultra-hydrasource-conditioner Ultra HydraSource Conditionerhttps://www.matrix.com/~/media/images/haircare/biolage/core/hydrasource/biolage_ultrahydrasource_conditioner_b-uh-c_na.jpg Conditions to help envelop and smooth dry, thick coarse hair. Apply to wet hair and leave in 1-3 minutes. Rinse thoroughly. We recommend that you pair ULTRA HYDRASOURCE Conditioner with ULTRA HYDRASOURCE Shampoo for extra moisture and hydration. Recommended for fine to medium hair. Rated 1 out of 5 by Inook1234 from Hair is dryer than ever.... I purchased this because I had used Biolage products years ago (before switching to Bain de Terre and Redken) and been satisfied. This conditioner is leaving my hair dry, increasingly coarse and almost brittle. A new formula? Cost-cutting manufacturer practices? Regardless of the cause, this is the last Biolage product I will ever buy (and imagine that I bought a *gallon* of this stuff). Rated 2 out of 5 by CLP88 from Not the same great formula or product I had been using Matrix Biolage Conditioning Balm for the last 25 years and had never once tried another product. I would buy it but the gallon from a hairstylist friend. It was wonderful on my hair, it left it silky, soft and it made it so easy to get the tangles out. I tried the new Hydrasource and I hate it. It is horrible. There is a huge difference in the products consistency. The balm was so think and the new Hydrasource is watered down. It's as good as not using a conditioner. I have been trying other pricey products like Wella, Pro Design Eufora and another matrix product and having no luck find something matching the old conditioning balm. Also the hydrating shampoo went from clear to a white creamy product and that is not the same either. I can always use another shampoo; the conditioning balm was like gold to me. Please bring it back. Rated 3 out of 5 by Longblonde from Milder scent than the other new stuff More dilute and a poorer value per dollar than the old Biolage Balm which was terrific. Still it's a decent though not great conditioner. This is the only conditioner I can use in the new lines because all the others are grotesquely overperfumed with faddish weird artificial scents. I am really annoyed. Rated 1 out of 5 by LizDee from Definitely not the same great formula! I was assured by a Matrix rep that this was the "same great formula" as the ultra hydrating balm, which was the only conditioner that worked on my hair and which I thought was discontinued. While the ingredients are almost exactly the same, I can assure everyone that it most certainly is NOT the same great formula! As at least one other reviewer mentioned, it left my hair extremely dry, unlike the old formula. The only difference in the ingredients list is the addition of phenoxyethanol, a preservative. I suppose the addition of a preservative could make that much of a difference, but it's highly disappointing. I saw that Matrix recommended Total Moisture to the reviewer who also had problems with her hair being overdried. I tried that conditioner once, and it was also drying to my hair. Not sure why Matrix had to change their formula. I would pay twice as much for the old formula (and have, just to buy any leftover ultra hydrating balms out there that I've found on Amazon) I can't use any of the Matrix products anymore, as they all make my hair feel like straw, except for the old hydrating balm. Rated 1 out of 5 by benhandel from want my hydraseal leavening conditioning cream bac I have wasted so much money trying to find a replacement product for my beloved hydraseal leave-in conditioning cream. I have been a loyal user for at least 10 years and turned many friends and family to it after they tried it from me. I stocked up a year ago when I realized it was going away...but my stash is gone. I have a bit left that I save for special occassions. It is so sad that I can no longer have a good hair day every day....and I only have a few good hair days left. I have a lot of very fine, wavy hair, that like to friz instead of wave with every other product I have tried. Please hear our pleas and bring back our product! Rated 1 out of 5 by Longlocks27 from Changed mind.. Hate it!!! This was good for about 2 days and then my hair became very dry and starting breaking off!! Bring back the old versions!!! These new ones now have started destroying my hair. Please please bring back the old blue detangler and old condtioning balm. Until then I will have to find another line of products.... Anybody have any suggestions for new products to use???? Rated 5 out of 5 by Longhair123 from Great results!!! I love the hydrasource conditioning balm!! I use it once a week as a deep conditioner on the days I don't use the hydrasource detangling solution and my hair has never looked better!! My hair is mositurized and full of shine and I have very long color treated hair with highlights! I love the hydrasource line!!! Great job biolage! !